Understand the difference between intent and impact. 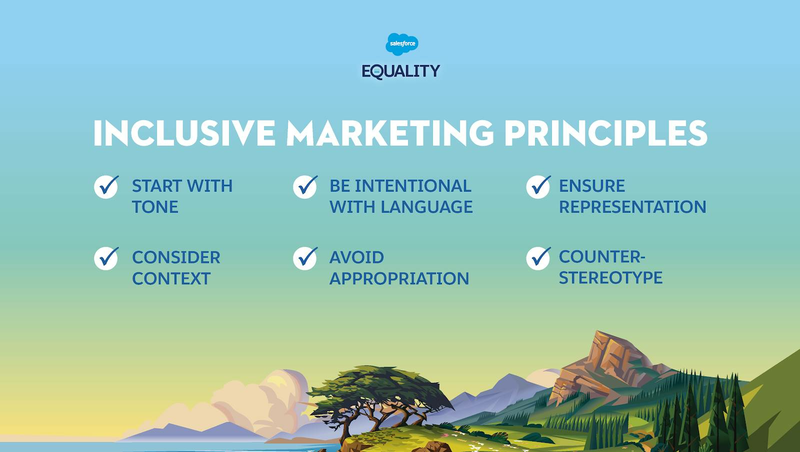 List the six principles of inclusive marketing. At Salesforce, we’ve been on a path to build a set of guiding principles to help support our content creators and events teams in creating marketing that is free of cultural bias, reflects the diverse communities we serve, elevates diverse voices, resonates with all of our customers, and leads with our core value of Equality for all. What you see here are six principles we’ve distilled and revised from months of focus-group testing and real-life challenges that called for a thoughtful, strategic, and structured solution. We certainly don’t have all the answers, but this unit is a summary of what we’ve learned along the way. We share these principles with you—our greater community—with the hope that they help you and your company, and they foster an open dialogue where we can learn from each other and grow together. We like to begin all conversations about Equality by underscoring the phrase: intention vs. impact. This is the idea that while the majority of the time we are all operating with positive intent, it’s the impact of our actions that truly matters. Throughout this unit, we present anonymized examples of companies (including ourselves) and individuals who have misstepped. In every case, we show the significance of the impact and real business implications. The point is not to shame anyone, but rather to learn from these actions together. As humans, our inclination is to feel defensive when accused of doing something wrong. We often hear people say, “I didn’t mean that to be sexist, but...” or “I’m not racist, but...” for instance. However, when we consider the impact of our actions, rather than focusing on our own intent, that’s when we can move forward and create better, more inclusive content that resonates with all. At the same time, it’s important to remember that we are all learning together and we all have and will continue to make mistakes. But we can commit to being open, listening with empathy, continuing our education, and driving progress forward. With any Equality-related topic, it’s important to remember that these issues aren’t clear-cut and they require brave, authentic conversations to reach the best possible decision. In our Inclusive Leadership Practices module we discussed the pillars of having these conversations as listening with empathy, creating a culture of transparency, encouraging healthy discourse, and emphasizing accountability and forgiveness. If you are a company leader, creating an environment where these difficult conversations can exist in a healthy, constructive, and productive way is key to starting this journey to inclusive marketing. In the next two units, we deep dive into what each of these principles mean, give examples of times companies misstepped, and provide ways to put these into practice in your own marketing.